Microsoft Marks GfW-Xbox Merger With "Million Microsoft Points Giveaway"
Microsoft is offering 400 free Microsoft Points to the first 2500 people who actually make a purchase from the Games for Windows Marketplace between now and the beginning of August. Microsoft's latest and greatest step in its ongoing effort to save PC gaming was the recent folding of Games for Windows into Xbox.com and to celebrate that bold maneuver, the company is holding a "One Million Microsoft Points Giveaway" promotion. Just be one of the first 2500 people to actually buy something from the GfW Marketplace and Microsoft will email you a code for 400 Microsoft Points, absolutely free. "Games for Windows Marketplace is open to millions of Xbox Live gamers around the world," Microsoft said in a message that I have to admit left me completely baffled. "Log in with your Xbox Live account and enjoy a single unified identity across Xbox Live and Games for Windows - Live. It's the same gamertag, friends list, achievements and gamerscore on both platforms." The contest began today and runs until 11:59 pm on August 1, or until all points are gone, whichever comes first, but unlike the Games for Windows Marketplace it's open only to citizens of the United States. And surely I can't be the only one who finds it disheartening or maybe schadenfreudistically hilarious that Microsoft is effectively admitting that it might not be able to ring up 2500 GfW Marketplace sales over the course of an entire freakin' week? Come on, guys, Steam probably racked up 2500 sales in the time it took me to type that sentence. 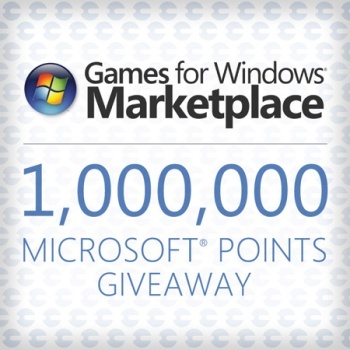 For more information about how you can earn 400 free MS points just by purchasing something from the GfW Marketplace [please, anyone], check out Xbox.com. The Games for Windows Marketplace is also now available at Xbox.com, under "Games + Marketplace" [third tab from the left], between Xbox Downloads and Avatars.